Amatrol’s Programmable Logic Controller (PLC) I/O Simulator Learning System – CompactLogix L16 (87-IOSAB53A) covers the operation and programming of programmable controllers, one of the most important and widely-used products in modern industry. Along with an Allen-Bradley L16ER CompactLogix Programmable Controller, learners will utilize the 87-IOSAB53A to practice real-world, hands-on skills used within automated line applications ranging from automotive to packaging to biotech. The 87-IOSAB53A requires a computer and any one of Amatrol’s Mechatronics Learning Systems (87-MS1 – 87-MS7) featuring the Mechatronics Learning System – CompactLogix L16 (870-AB53A). 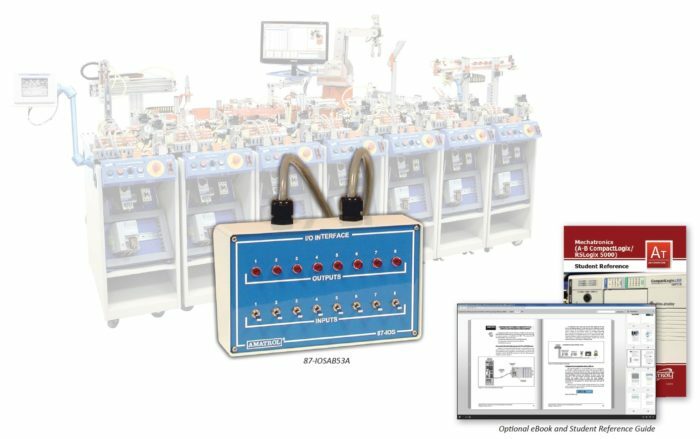 The 87-IOSAB53A includes a PLC Simulator Module using a PLC separate from the Mechatronics cart to simulate inputs via writing PLC programs. This combination of hands-on skill practice and comprehensive curriculum will further ingrain programmable controller concepts and applications in a learner’s mind and make more advanced topics easier to comprehend. This system will cover major topic areas like: basic programming, PLC motor control, PLC timer and counter instructions, event sequencing, application development, program control instructions, and math and data move instructions. The 87-IOSAB53A’s PLC Simulator Module includes eight indicator lights and eight input switches, as well as a connector set and power cable. When used in conjunction with a computer and an L16ER CompactLogix PLC featured on a Mechatronics cart, this simulator module will allow learners to practice a variety of hands-on skills. Some of these skills include: designing a PLC program to operate a reversing motor application; entering and editing a PLC program that uses an RTO (Retentive Timer On) instruction; designing a reciprocating actuator sequence PLC program; and entering and testing a PLC program that uses the First Scan Flag to initialize a program. The comprehensive curriculum included with the 87-IOSAB53A provides a strong understanding of PLC operation, programming interfaces, programming software, and the basics of ladder logic. Within this curriculum, learners will study topics like: seal-in program logic; retentive timer instructions; count up and down instructions; continuous cycle logic; stop functions; subroutines; add, subtract, multiply, and divide instructions; and move instructions. Optionally, this curriculum is available in an online eBook format. This eBook includes all of the content from the printed version, but provides an efficient online alternative with enhanced features such as keyword searches and zoom controls that enable a user to quickly locate and view information. The 87-IOSAB53A is just one in a large array of PLC options offered by Amatrol. Other Mechatronics options for L16ER Allen-Bradley PLCs include: Human-Machine Interface (87-HMIAB53A); EtherNet (87-ENAB53A); Barcode (87-BR1AB53A); RFID (87-RF1AB53A); and Vision Inspection (87-VS1). A sample copy of the Programmable Logic Controller – AB5300 Student Reference Guide is also included with the system for your evaluation. Sourced from the system’s curriculum, the Student Reference Guide takes the entire series’ technical content contained in the learning objectives and combines them into one perfect-bound book.